In the past, bad press has plagued reverse mortgages. It ranged from either high costs and potentially inappropriate uses for these funds to misguided ideas about the homeowner losing the title to their home. But much has changed in recent years. Since 2013, the federal government, through the Department of Housing and Urban Development, has continued to refine regulations for its Home Equity Conversion Mortgage (HECM ) program to improve the sustainability of the underlying mortgage insurance fund. This better protects eligible non-borrowing spouses and ensures that borrowers have sufficient financial resources to continue paying their property taxes, homeowner’s insurance and home maintenance expenses. 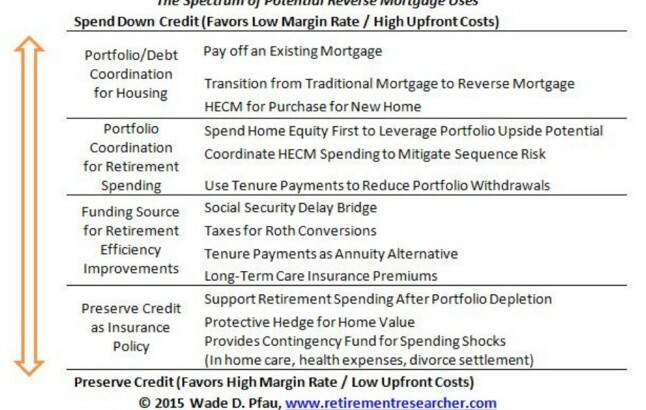 The reverse mortgage should be viewed as a method for responsible retirees to create liquidity for an otherwise illiquid asset, which in turn creates new options to support a more efficient retirement-income strategy. Articles, Financial Planning, Research & Wisdom, Retirement Planning, Reverse Mortgage Reverse Mortgage. permalink.